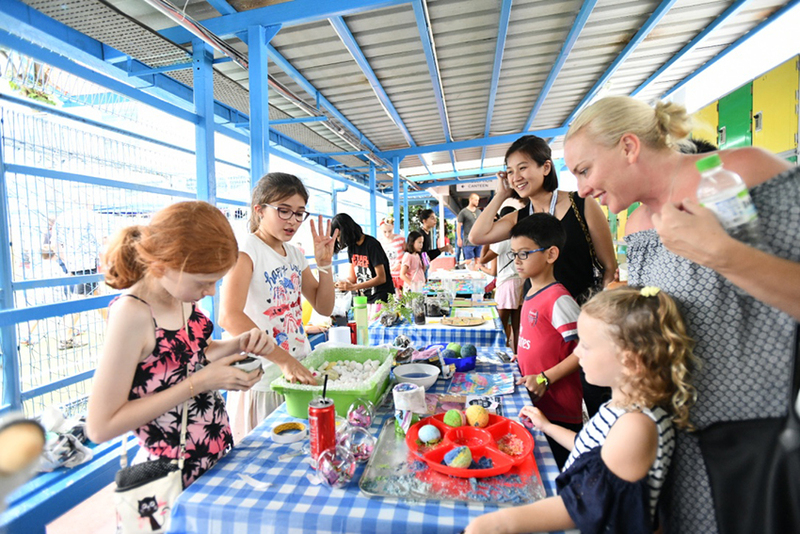 It was the annual School Fair and for our Secondary students, their last fair at the Orchard Campus. With almost the entire campus abuzz with activities, there was something for everyone. There were exciting friendly competitions such as Four Square, tug of war, dodgeball, obstacle run at the astroturf that drew much cheer and laughter. The younger ones loved the variety of crafts and activities in the homerooms. There was also a used book drive for book lovers. Those who were more game had their hand on the sponges toss activity and witnessed their teachers' faces being "showered" with the wet sponges. The BBQ and food stations selling yummy fingerfood and beverages satisfied some hunger pangs. A silent auction of beautifully wrapped hampers was held amid these activities. It was indeed a great day of fun and bonding with the great people of Chatsworth, our community. Huge thanks goes to absolutely everyone - organisers, contributors, visitors who played a part in it! Proceeds go toward our adopted charity, Blue Dragon.